Whenever we think of critical writing about music, from capsule album reviews on up, it’s hard not to recall that quote—apparently it remains a mystery as to who said it first—that writing about music is like dancing about architecture. The suggestion is that the value of music is apparent in and of itself, a priori, and that it doesn’t need to be discussed: the language of music is music, not words. It is a nice quip, which is why so many people repeat it—when Elvis Costello said it he added “it’s a really stupid thing to want to do”—but I don’t trust it. Anyone who writes about music begins with the belief that what they’re doing is meaningful and worthwhile. If they are approaching the task honestly, then it’s good writing. If not, then it’s bad writing: if they are writing in order promote something, then they’re not really writing about music, they’re marketing a product; if they are writing simply to condemn something, or to demonstrate their intellect, then they are simply insulting, especially to their readers, they are being dishonest. Better writing, honest writing, requires an approach rooted in some basic understandings. The first is an understanding that all music—good, bad, or otherwise—is like any other form of art in that each expression is part of an ongoing conversation about the world around us, our history, our foibles, and our desire as listeners to be lead on a journey somewhere beyond the moment that we are in. All art comprises–or attempts–a journey of imagination and of understanding. If those words were from a song on an early album, or one in the 1970s, we’d perhaps have an idea about what he was talking about, and an audience at that time certainly would, or at least they would have thought they did. The world was changing: the shootings in Ohio, the sense of disappointment coming out of Woodstock, Vietnam, and Watergate, the assassinations of the 1960s, the struggle for civil rights. The world was on its side, and the sun was going down on a lot of sacred cows. But the thing is, he didn’t write those words then, or at least he didn’t sing them then. Those words are from “Ring them Bells” which was released on the album Oh Mercy in 1994. The wall had just come down, give or take, and the malaise of the X generation was in full bore. Of course there was a lot else going on then too, but those are at least elements of the context in which he wrote about the world being on its side. More importantly, those are elements of the context that his audience would have heard them within. Indeed, Dylan himself described the song as an update to “With God on Our Side” which he released in 1964. That song was cranky, but in a sense it was hopeful. It implied, with a sneer, that we can have some perspective, and that the concept of God being on our side was an old, dusty one, one that we’d have (or want) a chance to revise. “Ring them Bells” is just a description of a world in disarray and confusion, entirely lacking of a compass to point the way. There is no other song from the album that had as much resonance. It is, I think we can say, the best song on that album, both for how it was written—yes it’s very skilfully done—but more importantly for how it entered the artistic conversation that was going on at the time. Commerce, of course, gets in the way. There are ticket prices, and album sales, but there is also PR, and corporate backing. Those who have been marketed well, and praised, are often able to rise above an honest critical eye. There is nothing that Bob Dylan will ever release that will be roundly condemned—he will always find someone to champion his work, including music journalists, no matter how off-putting it might be. Though, truly, he has released some positively awful stuff, such as the recent “Tempest” which probably gathered more negative critical perspective than anything Dylan has done. Yet, reviewers were kind. Jim Fusilli of The Wall Street Journal called the title song “undisciplined and banal.” Fusilli nevertheless writes of the album saying that “it is an uneven work whose finest qualities are found in the shadings and subtleties. At its best, it reveals the skills of a master craftsman who uses a variety of American musical forms to create atmosphere in support of his lyrics, which have grown increasingly novelistic and as such are keen-eyed, colorful and effective.” Subtleties? Really? I don’t think there is much subtlety in anything Dylan has done–he’s always been about spectacle, perhaps most obviously since Newport in 1965–and Tempest is true to his form. And would a master craftsman really let anything out of his shop that was “undisciplined and banal” hoping that we’d, nevertheless, appreciate it’s mastery? For people like Dylan, or Bowie, or the Rolling Stones, no matter how bad some of their music might be it would take an awful lot to unseat them critically. With them, and to the envy of others, jounralists will look for the good, not the bad. Dylan may create a mind-numbing, trying, 14-minute retelling of the sinking of the Titanic, but we’ll still note his use of a variety of musical forms, and his ability to create atmosphere (and, with a voice like that, there isn’t much more he’d be capable of—everything sounds like a bar). Likewise, bands like Red June will be overlooked, no matter how phenomenally good their music might be (as with Ancient Dreams, an album that will go unnoticed, and it’s a shame). If he’s right, then we don’t really need to understand the context for a work, but rather can access the work in its own terms–that writing about art is like dancing about architecture. The idea is appealing if only because it is so democratic: we all can approach art on the same level, and it doesn’t require expertise, just an openness of thought and perception. I read Rothman’s article during a trip with some friends to New York. Since Rothman, like de Botton, was using specific examples from the Frick collection, a friend and I decided to go to the Frick and test out the idea. At the time there was a collection of Dutch masters being shown in addition to the permanent collection. I took one of the audio guide headsets, but before listening to any of the commentary, I’d approach a painting and really look at it, wondering about what it was saying, about the relationships within it, and what thematic questions around “human-scale themes” they might be addressing. Then I listened to the headset, which of course presented all the “art-historical trivia” that we’d expect from an audio tour. And it was entirely enlightening. Elements of the paintings that, prior, had seemed minor, were brought into focus. This is why: the vast majority of us are not students of seventeeth-century art, for example, and therefore we don’t have all the tools in order to engage with the pieces in a way that we truly apprehend the human-themes within them. We don’t understand the symbols, or the stories that the artists were using as tools to tell their stories. We don’t understand the context for the piece of work. That doesn’t mean that we don’t understand the life story of the artist, rather, we aren’t privy to the conversation that the artist was joining into, what the artist had to say, the artist was working within, or who the artist was responding to. But it’s worth a bit of effort–not a phenomenal effort, but a bit of effort–because the cost is fantastically outweighed by the reward. Even the title is well worth knowing; it is a Dutch proverb that Steen’s audience would have known well. It means that children learn through example. Is the scene judgemental? We might at first feel that it is, what with the man slouching in the corner, the debauch taking place all around. Fine, but what you wouldn’t know without a bit of background is that Steen has put himself right there, in the thick of it; he is the man laughing while he teaches a boy how to smoke a pipe. We also wouldn’t know that Steen was an innkeeper, so he not only saw many scenes along these lines, but participated in them and profited by them. The old man is wearing a hat worn by young fathers. These are all things that he would have been confident that his original audience would have known. As such, perhaps he’s playing with their knowledge, bouncing ideas around, rather than documenting a time, a place, or his personal perspective on a time or a place. One of many scenes of this type that Steen painted, here the family is celebrating a baptism; the child is being baptized. Once we know that Steen has implicated himself in this, and he’s depicting a scene from within his social and political class, the piece becomes less judgemental, and we begin to look for other themes. Perhaps he’s saying that the child is not only being baptised into the life of the church, but into the life of the world, with all the good and bad that comes along with it. The parents will teach the child not only the things that they choose to—as perhaps the lessons of the gospel—but also all those things that they don’t choose to, such as smoking, and drinking, and lapses of responsibility. The parrot is a mimic, and it’s there in the corner adding a bit of punctuation to Steen’s idea. Then, as now, parrots were as likely to repeat swear words as they were names and “hello.” There is a stress in here that most parents share: we want our kids to reflect the better angels of our nature but, well, they learn lots of other things from us as well. So, is it trivia, or is the background worth knowing? Is a bit of context worth reviewing? Is it worth our while to try to get a sense of the conversation that artists were adding their voices to? I think it is. 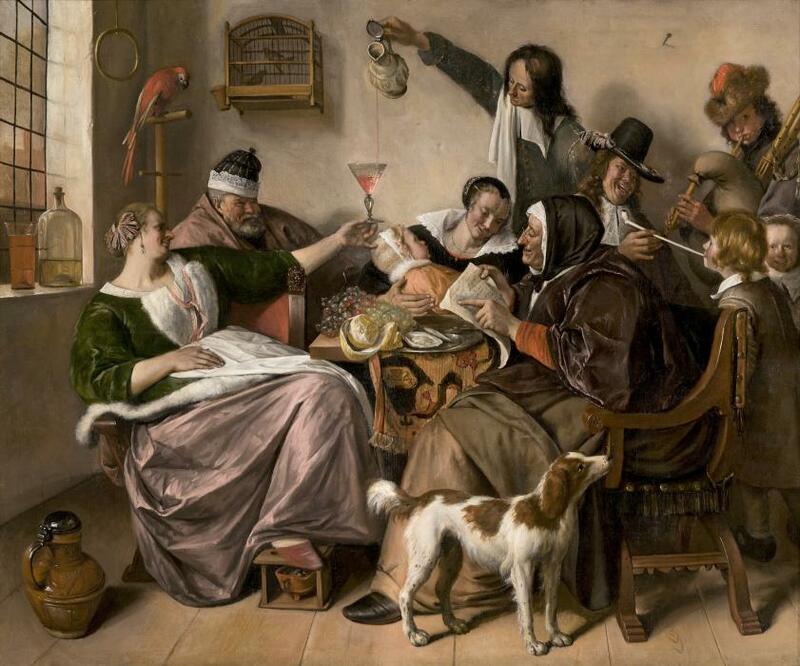 As in the Steen example, the image becomes richer with these kinds of details in mind, and brings forward the human-theme rather than obscuring it: We’d all prefer to be upstanding in every way, though in fact, we’re not, we’re imperfect, and family life is messy. Further is a question that Steen implies: is it wrong that children are brought up within the full range of family life, seeing everything, and learning both our good habits as well as our faults? What a great question. Perhaps Steen has included himself in the painting in order to suggest a potential answer, that children are resilient and perhaps openness is better than overprotection, and that everything that we teach them has value because it is part of ourselves. It nothing else, it just makes the picture more interesting to look at, it becomes a moving picture–moving through thought and idea–rather than a snapshot of a silly party all those years ago. It’s through some of this knowledge that the work really gains its ideas, its equivocation, and its interest. The ideas are richer than if we are left only to our own devices. Rather than therapy for the moment, we found ourselves able to get in on a conversation that lasts longer and could be, at least potentially, more meaningful; knowing a bit more adds to our experience, our thoughts, and the enhancement it can give to our lives. Putting the image in a room full of other Dutch paintings from the same time period, in this light, also seems to make sense. They are all speaking with each other, and if we can get into it a bit, we can get hear better what they are saying. Having them side by side only helps. A scholar of Steen might find the audio tour material limited given that she knows the entire range of things about Steen’s life, his work, and his world that the material there can only hint at. For the rest of us, while it may be limited, it gives us a necessary and welcome step up. A good writer doesn’t tell us that he likes mustard on a hotdog, but rather he tells us what mustard is, what a hotdog is, and ventures why you might like it on a hotdog, or how it relates to the culinary culture and why. I think that’s what good writing about music can do, too. Each piece, whether or a review or a longer essay, needs to be about something, not just the person who made the music, or the songs they present. Good writing tells us about the context and gives us a sense of the larger conversation that the music is engaging within. Good writing can let us know why music is important, what it represents, what kinds of things to listen for and why it is worthy of our attention. As well, good writing is readerly even to those who may never hear the recording being discussed. Rather, the recording is used as peg to hang an idea on, such as how times have changed, or how we judge quality, or some aspect of the history of music that is interesting and telling, or even how art interacts with the culture that creates it. Each piece should have some bit ideas, or at least some biggish ideas. Laurence Stern said “Writing, when properly managed, (as you may be sure I think mine is) is but a different name for conversation.” And, as at a cocktail party, it is polite, for the most part, avoids diatribes, and listens as much as it speaks, just like the most enjoyable party guests do. It interacts with the greater world, reaching out and inviting others in rather than shutting them out. It’s knows that it can only provide one moment, and works not to kill the conversation, but to open it up, add to it, and to keep it going for the sake of understanding, or enjoyment, or just to underscore the idea that we aren’t alone.